I have a shelf for all of the video games that I own. I’ve sold and lost many along the way, but a fair number of games that I’ve owned since my years in single digits have all been on this one shelf. At least, that’s the way it had been, until yesterday. That was the day when every video game I owned went from being on one shelf.... to two. First of all, I should explain that no video games are actually on that shelf. My room is on the second floor of the house, and all of my video games are in the basement. I’m far too lazy to walk up and down two flights of stairs every time I want to switch out a game, so I have a CD wallet for all of my games on discs that I keep near the consoles. The GameCube games are a bit awkward in there, but the Wii, Wii U, and PS4 games fit like a charm, which is to be expected. For DS (including 3DS) games, I have a nice Zelda case that I got from Club Nintendo (RIP). Unfortunately, I still own too many DS games for them all to fit in that case, so I own a bunch of tiny cartridge cases for them there, as well. I also own one GameBoy game, one GameBoy Color game, and two GameBoy Advanced games. The solution for these games are... less elegant. I stick them in the drawer where the DS games are and hope I don’t lose them. This is also where I store my DS lite (kept for sentimental reasons; never played), GameBoy Advanced SP, and New 3DS XL. For Switch games, I currently only own four, and the case that came with the special edition of The Legend of Zelda: Breath of the Wild has space for nine, so I just keep them in there for now. And then we get to the cases. Until yesterday, I kept 54 of my 57 cases on the shelf, with the final three being on a music stand. These games are the three games that I’m currently playing, and my rules since my last article on this topic have changed slightly on how I play them. The game on the right is a console game, and the game in the middle is a portable game. This way, I have two games to play, but they’re never fighting over my attention as my decision as to what to play is 100% location-based. Currently, the former is The Last of Us and the latter is Splatoon 2. The game on the left is my relaxation game, which can be either portable or console, but I usually play it at home. Anyway, I really had an itch to play Splatoon 2 even though I was home, just to beat the boss of that area. But if I didn’t adhere to my own rules once, I knew that would lead to breaking them again and again to the point where my backlog stayed in the sad state where it still is. And thus, I allowed myself to play Splatoon 2 at home only by rearranging the games on the stand. I shifted Splatoon 2 from the middle to the right, taking off The Last of Us, and replacing my portable title with Fire Emblem Echoes: Shadows of Valentia. However, you’ll notice a problem if you look at the picture of all of my games for long enough. The 3DS cases are stacked on top of all of the DS games, so if you take a 3DS case out, it doesn’t make the row of games any thinner. And so, I made my row of games longer by taking out a game that didn’t make it any shorter and putting in one fat case. I tried to force it in for a while, but after I heard an unpleasant cracking sound from some of the cases, I stopped immediately. It was time for a second shelf. I cleared away some of my old taekwondo boards and belts from my childhood, leaving space for half of a shelf. I decided to keep all of my Nintendo games on the bottom and have my PlayStation and Xbox games on the top. I used my question block as a paperweight to keep the cases from falling, and voila! A second gaming shelf has been born! I know it’s not the most exciting concept, but it marks the first time the video games that I’ve owned have gone beyond being put on one shelf. You could say it marks how I have grown as a gamer, having wide enough of a taste in games to fill more than a single shelf. 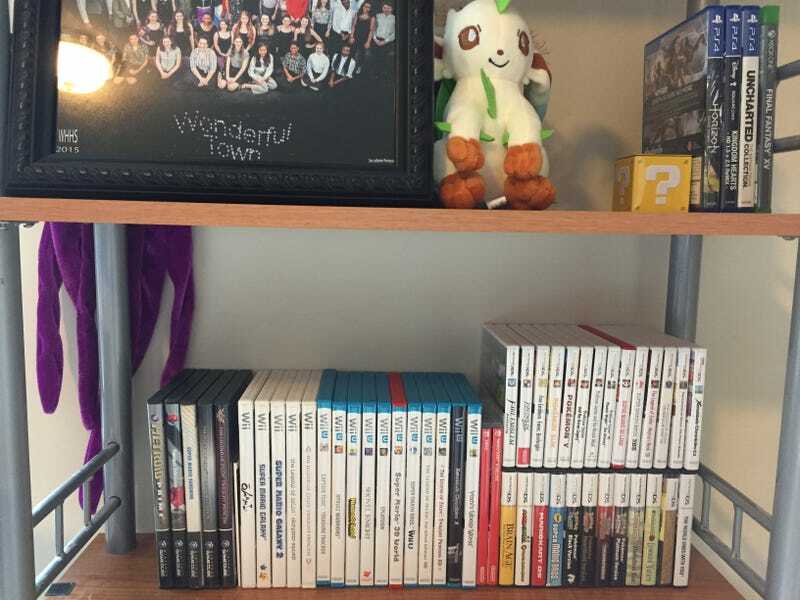 Or you could say that I’m crazy for writing 813 words about moving game cases to a second shelf.